Meatball lovers united Sunday at Rosebud on Taylor to cheer on eight amateur chefs who made it to the finals of the annual Do You Have The Meatballs? contest. But it was firefighter Bill Anaszewicz who blew the competition away with his baked meatballs of ground beef, pork and veal. He told 312DD that he used his fellow firefighters as guinea pigs for three weeks, testing out various recipes until he perfected a winning formula the night before the finale. As the grand prize winner, Anaszewicz will be treated to a luxurious trip to Wine Country for two, plus his meatballs will appear on Rosebud on Rush's menu all next week. Check out the Gold Coast institution next week, or you can also make them at home because we've got the recipe! Saute onion in the olive oil for five minutes. After three minutes add the garlic. While onions and garlic are cooking, mince tomatoes in blender. Remove onion and garlic from pan, then add pork shoulder to remaining olive oil and brown 5 to 10 minutes. Add tomatoes, tomato paste, bay leaves, red pepper flakes, salt, pepper, onion and garlic to pot with the pork. Let simmer for an hour; add cheese. If you like the sauce thinner puree in blender. Mix ground beef, veal and pork together. Soak torn bread in milk for a short time then add to meat mixture. Mince garlic and saute in olive oil, then add to meat mixture. Add salt, pepper, egg and Italian parsley. Mix ingredients, but try not to over-mix. Roll meat mixture into 1-inch meatballs and then dredge in flour. Fry the meatballs in oil mixture. Place in sauce. It makes about 20 large meatballs. Soak the tortilla chips in milk in a mixing bowl; allow liquid to be absorbed. Add salt, pepper, herbs, parsley and cheese; stir to incorporate. Add ground sirloin and with a fork, gently start to mix. Do not mash or work with hands. Use the tines of the fork to gently mix. Add beaten egg and continue to incorporate until thoroughly combined. Line a sheet pan with aluminum foil and drizzle with olive oil. 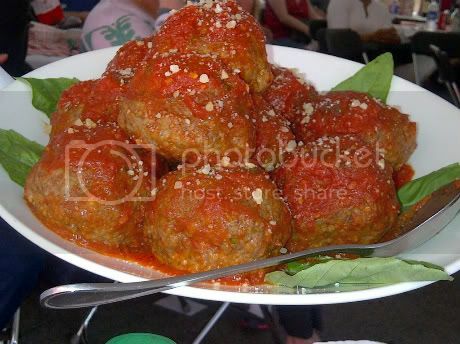 Do not roll or pack the meat mixture, but use the same fork or a spoon and create a rustic-shaped meatball. Place on foil. Broil on high until browned, turn over and brown other side; approximately 7-10 min per side. Yields 14 meatballs. Delicious as is or added to the last 20 minutes of cook time of your favorite sauce.